Twice in the Book of Mormon the prophet Lehi was called a “visionary man”; once by his sons Laman and Lemuel (1 Nephi 2:11) and once by his wife Sariah (1 Nephi 5:2). On the latter occasion, Lehi himself acknowledged that he was indeed a “visionary” man, affirming, “If I had not seen the things of God in a vision I should not have known the goodness of God, but had tarried at Jerusalem, and had perished with my brethren” (1 Nephi 5:4). The Book of Mormon phrase “visionary man” is curious since it does not appear elsewhere in Latter-day Saint canon. Nevertheless, this language appears to draw authentically from the world of ancient Israel. The roots rāʾāh and ḥāzāh are both attested in biblical Hebrew and denote “to see” or “to perceive.” The biblical term “seer” is commonly derived from rāʾāh (cf. 1 Samuel 9:9, 11), while ḥāzāh underlies most biblical instances of the word “vision” (cf. Isaiah 1:1). In many cases the two roots are “barely distinguishable,” since they overlap considerably and both describe either the seers themselves or the visions being seen by them, depending on the context. Given that “both Hebrew roots have the verbal meaning of ‘to see’,” it is not entirely clear which words would apply to Lehi. Nevertheless, contextual clues make it appear “that [ḥôzĕh] is behind the Book of Mormon term visionary man, while [rôʾeh] is probably the word behind seer in 2 Nephi 3:6–7, 11, 14 and Mosiah 8:13–17.” That is to say, Lehi was a prophet like Isaiah who saw visions (ḥăzôt), whereas king Benjamin (or possibly Mosiah) was a seer (rôʾeh) who could translate records with divinely prepared oracular instruments (Mosiah 21:28). This reading is supported by Lehi’s use of a Hebraism called the cognate accusative (when a verb and its object share the same root) in two separate instances. The first appears when Lehi assured his wife Sariah, “I know that I am a visionary man [Hebrew: ḥôzĕh; “seer”; alternatively ʾîš ḥāzôn/ḥezĕyôn; lit. ‘man of vision’]; for if I had not seen [ḥāzāh] the things of God in a vision [ḥāzôn/ḥezĕyôn] I should not have known the goodness of God, but had tarried at Jerusalem, and had perished with my brethren” (1 Nephi 5:4). Later, in a memorable line, Lehi reaffirmed his visionary ability by informing his family, “Behold, I have dreamed a dream [Hebrew: ḥălômtî ḥălôm]; or, in other words, I have seen a vision [Hebrew: ḥāzîtî ḥāzôn; lit. ‘seen a seeing’]” (1 Nephi 8:2). While this reconstruction must remain tentative without access to the original text, it is especially plausible given the attestation of both cognate constructions in the biblical corpus and of biblical “visions” (ḥăzôt) being granted in dreams at night. Figure 3 Lehi’s vision from 1 Nephi 8. Into the Light by Lehi Sanchez. The Book of Mormon’s description of Lehi being a “visionary man” places him in the same tradition as other biblical prophets, including most notably Moses, but also the great visionaries Isaiah and Lehi’s contemporary Jeremiah. 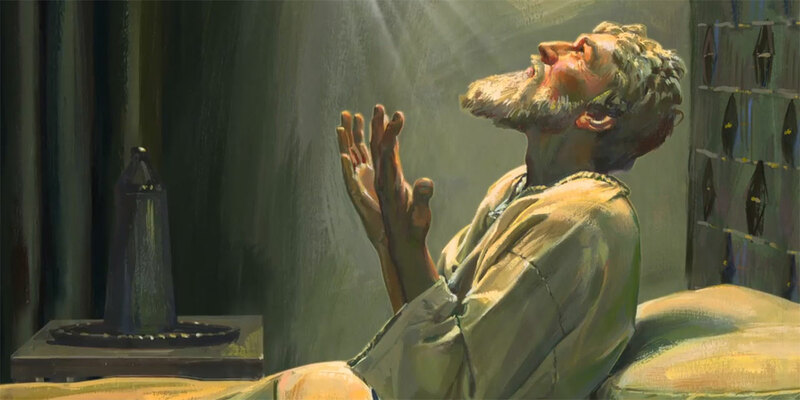 Like Moses, Isaiah, Jeremiah, and other biblical prophets, Lehi was indeed one blessed with visions of the Almighty and His divine council, a telltale sign of a true prophet in ancient Israel (1 Nephi 1:5–15). This in turn naturally heightens the legitimacy of Lehi’s own prophetic calling, leaving little doubt as to why Nephi preserved this important description in his retelling of his father’s life and ministry. The description of Lehi as a “visionary man” is significant for modern Latter-day Saints in another way. It is important to keep in mind that when Lehi’s sons and his wife Sariah called him a “visionary man,” they did so to complain and cast doubt on the truth of his visions. Lehi’s response to his family’s murmuring, however, is instructive. Rather than being crippled by criticism, Lehi used the opportunity to reaffirm his testimony and turn an intended insult into something positive. This is a laudatory model for modern Latter-day Saints to emulate in their daily lives. John A. Tvedtnes, “A Visionary Man,” in Pressing Forward with the Book of Mormon, ed. John W. Welch and Melvin J. Thorne (Provo, UT: FARMS, 1999), 29–31. Matthew Roper, “Scripture Update: Lehi as a Visionary Man,” Insights 27, no. 4 (2007): 2–3. Dana M. Pike, “Lehi Dreamed a Dream: The Report of Lehi’s Dream in Its Biblical Context,” in The Things Which My Father Saw: Approaches to Lehi’s Dream and Nephi’s Vision (2011 Sperry Symposium), ed. Daniel L. Belnap, Gaye Strathearn, and Stanley A. Johnson (Salt Lake City and Provo, UT: Deseret Book and Religious Studies Center, Brigham Young University, 2011), 92–118. Ludwig Koehler and Walter Baumgartner, The Hebrew and Aramaic Lexicon of the Old Testament (Leiden: Brill, 2001), 2:1159. For instance, in 1 Samuel 3:15 the young prophet Samuel is said to have been afraid to tell his “vision” (marĕāʾh) to the priest Eli, while in 2 Samuel 24:11 the prophet Gad is called a “seer” (ḥôzĕh). Other instances of ḥôzĕh being translated as “seer” include Amos 7:12, 1 Chronicles 21:9, and Isaiah 29:10. This confusion is likely the result of the ambiguity inherent in the English term “seer,” which in common usage can range from generic visionaries to those who profess an ability to use oracular instruments such as seer stones or diving rods. John A. Tvedtnes, “A Visionary Man,” in Pressing Forward with the Book of Mormon, ed. John W. Welch and Melvin J. Thorne (Provo, UT: FARMS, 1999), 29. On the identity of the king who translated the Jaredite records, see Book of Mormon Central, “Which Nephite King Had the Gift of Interpretation?” KnoWhy #99 (May 13, 2016). On the cognate accusative in the Book of Mormon, see John A. Tvedtnes, “The Hebrew Background of the Book of Mormon,” in Rediscovering the Book of Mormon: Insights You May Have Missed Before, ed. John L. Sorenson and Melvin J. Thorne (Provo, UT: FARMS, 1991), 80–81; Melvin Deloy Pack, “Hebraisms,” in Book of Mormon Reference Companion, ed. Dennis L. Largey (Salt Lake City, UT: Deseret Book, 2003), 322–323. For the “dreamed a dream” cognate accusative, see Genesis 37:5, 9; 40:5, 8; 41:11; Deuteronomy 13:3; Judges 7:13; Daniel 2:3. For the “seen a vision/seeing” construction, see Isaiah 1:1; Ezekiel 12:27; 13:7, 16. As noted and discussed in Tvedtnes, “A Visionary Man,” 30–31. For the attestation and context of nighttime visions in the biblical world, as well as for the ancient context of Lehi’s visionary dream, see Dana M. Pike, Lehi Dreamed a Dream: The Report of Lehi’s Dream in Its Biblical Context,” in The Things Which My Father Saw: Approaches to Lehi’s Dream and Nephi’s Vision (2011 Sperry Symposium), ed. Daniel L. Belnap, Gaye Strathearn, and Stanley A. Johnson (Salt Lake City and Provo, UT: Deseret Book and Religious Studies Center, Brigham Young University, 2011), 92–118. See Book of Mormon Central, “Why Is Lehi Depicted as Similar to Moses?” KnoWhy #268 (January 30, 2017). See David Rolph Seely and Jo Ann H. Seely, “Lehi and Jeremiah: Prophets, Priests, and Patriarchs,” Journal of Book of Mormon Studies 8, no. 2 (1999): 24–35, 85–86; Stephen D. Ricks, “Heavenly Visions and Prophetic Calls in Isaiah 6 (2 Nephi 16), the Book of Mormon, and the Revelation of John,” in Isaiah in the Book of Mormon, ed. Donald W. Parry and John W. Welch (Provo, UT: FARMS, 1998), 171–190. See Matthew Roper, “Scripture Update: Lehi as a Visionary Man,” Insights 27, no. 4 (2007): 2–3; Book of Mormon Central, “How Did God Call His Prophets in Ancient Times?” KnoWhy #17 (January 22, 2016). See additionally the observation in Stephen O. Smoot, “The Divine Council in the Hebrew Bible and the Book of Mormon,” Interpreter: A Journal of Mormon Scripture 27 (2017): 173. Neal Rappleye has suggested that Laman and Lemuel called their father a “visionary man” as “a direct result of their acceptance” of a school of thought in ancient Israelite religion. This religious movement held that “a proper prophet” should not indulge in visionary experiences. In other words, they were declaring that Lehi’s claims to have visionary experiences made him a false prophet! See Neal Rappleye, “The Deuteronomist Reforms and Lehi’s Family Dynamics: A Social Context for the Rebellions of Laman and Lemuel,” Interpreter: A Journal of Mormon Scripture 16 (2015): 92–93.